Comprehensive Range of Flexible Actuator Solutions for Slurry Tanks | Venture Mfg Co. Farmers employ various applications and processes to improve their yield. They depend on a combination of organic and chemical fertilizers to enrich their crop quality. The organic fertilizers are produced in-house by combining manure with plant waste and other organic substances. Today, farmers are setting up biogas processing plants in their farms to meet the requirement of organic fertilizers. However, manure management is not easy and is a dangerous task. The fumes produced by the biogas plant can be dangerous. Venture Mfg. Co. provides actuators for slurry tanks, which helps a farmer in efficient manure management process from a safer distance. Electric Linear Actuators: Our electric linear actuators allow users to gain precision and control over their slurry management devices. These actuators are easily programmable, and allow users to manage the motion and force profiles without reconfiguring the machine. Controlling opening and closing of a manure spreader, when the device is operated from the tractor cabin for a safe operation. Operating knife and butterfly valves at a safe distance while transferring manure from a slurry tank. Providing IP69K protection for the manure environment. The following benefits of our actuator solutions make them popular with farmers in the USA. Easy to Install Interface: Our actuators feature simple designs and easy to follow communication units and control interfaces. The electric actuator systems can be easily interfaced with data bus communication systems as well as control systems. Easy Positioning: The positioning of the actuator is more accurate than other competitor actuator solutions. Our electric linear actuators feature integrated encoders that allow the user to control position and velocity. Lightweight and Compact Design: Our linear actuators are well-known for their compact, and lightweight designs, which makes them ideal for various types of agricultural equipment. Reliable Performance: Our linear actuator systems for slurry control are made from durable materials, and have undergone rigorous climate testing. This ensures maintenance-free, and long term operations. Meets Compliance Standards: Our electro linear actuators are designed to meet RoHS and IP6 compliance standards. Venture Mfg. 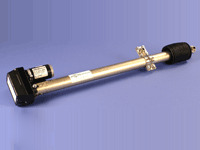 Co. provides a comprehensive range of flexible actuator systems. 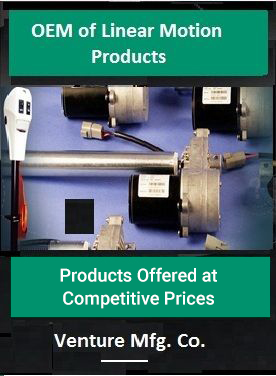 All our actuator systems provide excellent performance at cost-effective prices. Also, we can provide custom actuators for slurry tanks as well as other farming equipment.